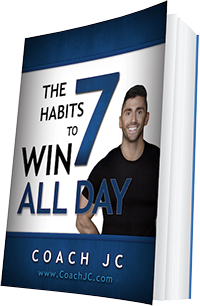 Today’s WINNING recipe to meet Coach JC’s 10 WINNING Habits is Chicken Buddha Bowl with Spicy Mango Sauce. Where are my veggies? Where is my lean protein? In high-speed blender, blend Mango Sauce and set aside. On two lined baking sheets, toss sweet potato with olive oil and salt on one and broccoli with olive oil and salt on the other. Roast 45 minutes until fork tender. When done, toss broccoli with chili paste. Place 1/2 cup of greens in each bowl. 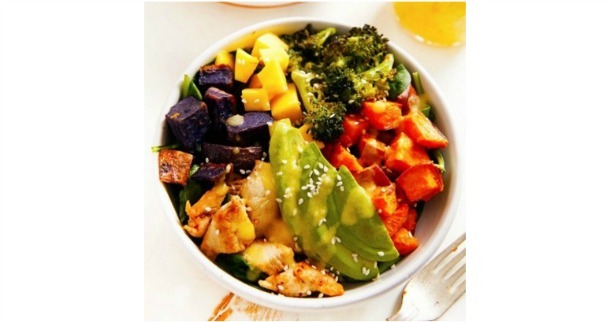 Top with roasted potato, avocado, chicken, m mango and drizzle or toss with sauce.